Back in 1983, before any of this name calling had started, Malcolm Fraser was the PM, BMX Bandits introduced us to Nicole Kidman and Bryan Adams was on the radio, as a 21-year-old Cadet Jones marched into the Police Academy. Back then he was 182cm tall and weighed in at 90kg…he’s a little heavier now, so maybe he’s a bit taller? For his academy instructors, Cadet Jones was mentored by rugby league legends Mal Meninga and Wayne Bennett, and the mix of these two perhaps best accounts for his style of policing: the presence of Meninga and the conversational style of Bennett! The drunk looked confused and quizzed “What have I stolen?” – to which Leroy replied simply: “Oxygen!”. Rookie Jones learnt pretty early that there is no point trying to reason with drunks, and he got plenty of exposure to them at City Station, Fortitude Valley, and then on to Central Queensland stations including Rockhampton, Woorabinda and Capella. It was during these formative years that the internet began – and Constable Jones ‘embraced’ the new technology: perfecting a two-finger typing technique that became the hallmark of his slow (but meticulous) paperwork. Outside of work, 1987 was the year that he proved irresistible to a certain blonde hairdresser, who was even prepared to move to Rockhampton. Underneath his hard exterior, Shelly found what those close to him know: the sense of humour, his love of a party, the Boston Red Sox and all things American – not to mention a finely manicured moustache. By the time she found out he shared her love of country music, there was a ‘country road to take them home’…all the way to Rainbow Beach. “It may not have been Urban, but there was a lot of Keiths”, Leroy recalls of their move here in 1990. Initially stationed at Gympie, Lee is still remembered fondly by the ‘old guard’ at Gympie Station, and it was there that his 27-year love affair with the Gympie Country Music Muster began. However, it’s fair to say that even back then his main sights were set on making his home town a better place – a town which at that stage did not see too many police cars. Unregistered and unroadworthy cars (once a common sight) disappeared from the streets, as did numerous drink drivers. With his transfer to Tin Can Bay station in 1999, drug dealers started to receive some attention and rumours circulated that Leroy kept a list of names in a black book… if your name was in it – you’d be better off leaving town! I cannot confirm or deny the existence of such a list. However, I have observed some of Leroy’s ‘clients’ leave and – coincidentally – the town has become a better place! Making this area a better place is something Leroy has been committed to for a variety of reasons, not the least of which is that it was the town that he and Shelly chose to raise their two children. Both Jack and Jordi can be immensely proud of their old man for his role in their lives, and the fact that he has contributed so much to their hometown. 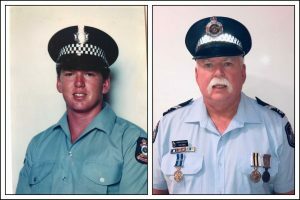 Separate from policing, Leroy has played a significant role in the Rainbow Beach community in a volunteer capacity. Even a cursory glance at the honour board at the Sports Club reflects his role on the committee from 1991 and as secretary from 1996 – 2018, not to mention his role as a very witty MC during the annual Fishing Comp. All of the above is just one snapshot of a 35-year career for which this short column could never hope to do justice. There are many, many stories that are perhaps best told over a few beers sitting around a fire on the beach at sunset (a Jones family favourite thing to do). Hi Heatley & Michelle, I just wanted to express my heartfelt thanks to you both for your support and professionalism in helping me bring together the Rainbow Beach Cooloola Medical Centre. Without your belief in what I was trying to do, it would have been much harder to achieve such a successful outcome. Your newspaper deserves every accolade! Again, many many thanks. Hello guys brendan here from Dirty Down Under 4×4 thanks for the fly over on Saturday looks fantastic. Visit Rainbow Beach magazine for New Zealand Congratulations Hello From NZ I just want to congratulate the Rainbow Beach Community for their fantastic initiative to advertise themselves via a newspaper insert in the New Zealand Herald yesterday. When we lived on the Sunshine Coast we visited your region and loved it. I hope this initiative brings many visitors because it is a fantastic place. Rainbow Beach Cooloola Coast Community News!! A super MASSIVE THANK YOU to you guys!! For your unwavering support and HUGE effort you have put in to spread the news of this event far and wide! We all Thank you from the bottom of our hearts for your time and enthusiasm. For all your efforts on the AMAZING Flyer that we are seeing pop up everywhere. We are enjoying the RBCCN more and more, you are both doing a fantastic job and making Rainbow Beach a fun and vibrant place to live. Lovely to see the paper out today. Looking forward to seeing the pics and what a great day the kids had in the Stephanie Alexander Kitchen Garden Foundation garden. Thanks guys.